If you have lost a full arch of teeth or are on the brink of having all of your teeth extracted, a solution that promises “Teeth In a Day” may seem too good to be true… but we’re asking you to have a little faith. Many patients who need a complete tooth replacement can benefit from All-on-4 dental implants in Bullard, which gives you a complete fixed denture in under 24 hours. Intrigued? We thought you might be. Keep reading to learn more about Teeth In a Day — and whether or not it’s right for you. All-on-4 is a revolutionary implant method that allows your dentist in Bullard to place a fully-fixed denture in the upper or lower jaw with as few as 4 dental implants. Because the entire treatment can be performed in less than 24 hours, All-on-4 is also known Teeth In a Day. This method works using the strategic placement of dental implants that are longer than traditional implant posts, meaning they can draw maximum support from the jawbone. Two implants are placed in the front of the jaw, where the bone is strongest. Two to three implant posts are then placed at an angle along the sides of the jaw. Because the All-on-4 method takes maximum advantage of your jawbone’s strength, it can eliminate the need for preparatory bone grafting procedures that are often required when getting traditional dental implants. Traditional dentures are only supported by your gum tissue, while an implant-retained prosthetic is affixed to sturdy posts secured within your jaw. All-on-4 dental implants will not slip around or cause whistles in your speech, which can occur with a traditional denture. A fixed prosthetic looks and feels more natural. 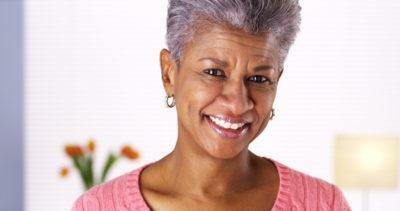 Traditional dentures require replacement every 5 to 7 years due to the changing shape of your jawbone. While an implant-retained prosthetic will need to be updated periodically due to gradual wear and tear, fewer replacements are required overall. There is no need for denture creams or adhesives thanks to the stability of dental implants. Many patients who have experienced total tooth loss are eligible candidates for All-on-4 dental implants. It can even help patients who have long believed they were ineligible for dental implants enjoy the stability and security of a comprehensive replacement option. Don’t hesitate to contact your implant dentist and find out whether or not you can benefit from All-on-4 or Teeth In a Day for a complete, long-lasting smile! Dr. Tad Morgan is a general dentist with extensive experience across all fields of dentistry and over 1,000 hours of continuing education to his name. To learn more about All-on-4 dental implants or any of his other tooth replacement solutions, you are invited to contact the “dentist near me” you’re searching for at 903-825-1112.